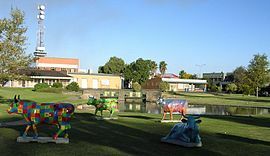 Shepparton (/ˈʃɛpərtən/) is a city located on the floodplain of the Goulburn River in northern Victoria, Australia, approximately 181 kilometres (112 mi) north-northeast of Melbourne. 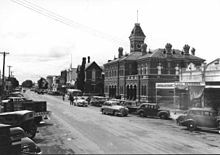 At June 2016, the estimated urban population of Shepparton, including Mooroopna, was 50,198. 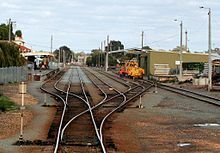 Shepparton has numerous primary schools, such as state schools Bourchier Street Primary, Gowrie Street Primary, Guthrie Street Primary, St Georges Road Primary School, Grahamvale Primary, Kialla West Primary, Kialla Primary, Wilmot Road Primary, Shepparton East Primary and Orrvale Primary. 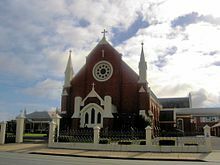 Catholic primary schools include St. Brendan's, St. Mel's and St. Lukes (shares a location with Notre Dame College, Shepparton Emmaus Campus. It also has two schools catering for students with disabilities, called Verney Road School and Berry Street School.